Will Hiking Three Times a Week Help You Lose Weight? Hiking is one of the best ways to lose weight. Not only do you burn more calories than you do going on a simple walk, but you get to enjoy the beauty of the natural setting where you are hiking. Hiking can become much more than an exercise you do in order to lose weight -- it can become an obsession, or at the very least, a treasured activity. Many different variables affect how much weight you will lose by hiking on a regular basis. Your diet, your current weight and the terrain where you hike can all affect your results. One thing is for certain, however; if you eat the appropriate number of calories for your height, age and gender while hiking on a regular basis, you'll start to see your extra pounds disappear. Hiking burns considerably more calories than walking, and if you previously stuck to walks around the neighborhood for exercise, you are likely to see a pronounced increase in weight loss. 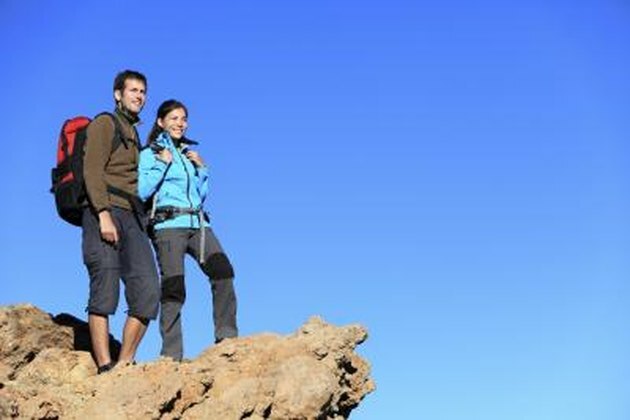 A 175-pound person who hikes for two hours can burn 1,100 calories, provided the terrain is hilly. If the same person spends two hours walking on flat terrain, she will burn approximately 500 calories. Over the course of a week, if you hike for a total of six hours, you will lose 1/2 pound more than the walker. Hiking is an efficient way to exercise. The steeper the grade that you hike, the fewer miles you will need to hike in order to see results. For example, if you walk at a 20 percent uphill grade for six miles, the resulting energy expenditure is the same as if you'd walked 18.9 flat miles, according to SocialHikes.com. Terrain vastly affects the number of calories you will burn hiking, and thus, the amount of weight you will lose. A 175-pound person who hikes three times a week for two hours each outing is likely to lose approximately 1 pound per week if the calories consumed are the number required to maintain weight. Keep in mind that you may lose less if you weigh less or more if your weight is higher. To increase weight loss, do a couple of long hikes every month. Consider backpacking, which burns even more calories due to the extra weight you are carrying. You can have a lot of fun hiking to a remote camping spot and hiking out the next day -- burning plenty of calories the entire time. How Much Weight Can You Lose If You Jog for 15 Minutes Each Day?